Curious about Google Sites and how team collaboration Web sites can help you share documents online from various locations? Curious about Google’s new Chrome browser? 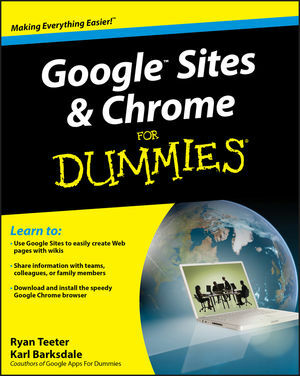 Google Sites & Chrome For Dummies has what you want to know! You’ll even find instructions and examples to help you plan sites for personal and business use, plus a sample college course site. With advice from Google Sites & Chrome For Dummies, you can make collaboration easy and have the high-speed Web at your fingertips. Ryan Teeter was an external trainer for Google, where he developed a comprehensive training program for corporate customers and Google Apps users. Karl Barksdale has written more than 50 business and technology books, and has consulted for both Microsoft and Google. Part I: Getting Started with Google Sites and Chrome. Chapter 1: Befriending Google Sites. Chapter 2: Getting to Know Chrome. Chapter 3: Signing Up for Google Apps and Getting Your Team Online. Chapter 4: Exploring Google Sites. Part II: Constructing and Sharing Your Google Site. Chapter 5: Mastering Page Layouts and Tools. Chapter 7: Customizing Your Site’s Look and Feel. Chapter 8: Bringing Collaboration to a New Level. Part III: Getting the Most Out of Chrome. Chapter 9: Perfecting Chrome Browsing. Chapter 10: Uncovering Chrome’s Advanced Features. Part IV: Building Your Own Scheme. Chapter 11: Proffering a Personal Scheme. Chapter 12: Building a College Course Scheme. Chapter 13: Building Business Schemes. Part V: More Google Apps You Can’t Do Without. Chapter 14: Using Google Docs and the Docs Home. Chapter 15: Docs: Google’s Word-Processing App. Chapter 16: Calculating with Google Spreadsheets. Chapter 17: Creating Amazing Google Presentations. Chapter 18: Using Google Calendar. Chapter 19: Communicating with Gmail. Chapter 20: Enhancing Communication with Google Contacts, Video Chat, and Talk. Chapter 21: Ten More Ideas for Your Scheme. Chapter 22: Ten More Google Apps for Your Team.